Wheeled string trimmers, also called walk-behind string trimmers, feature rugged string trimmer heads attached to a walk-behind frame and use two large wheels for maneuvering over rough terrain. A walk-behind string trimmer covers a much wider cutting area than a hand-held string trimmer. Overgrown lots and thick fields of weeds are no match for such a powerful piece of equipment. There are two particular features that make wheeled string trimmers the best choice for tackling rough terrain and thick brush: their wheels and their cutting width. The wheels on walk-behind string trimmers are large. 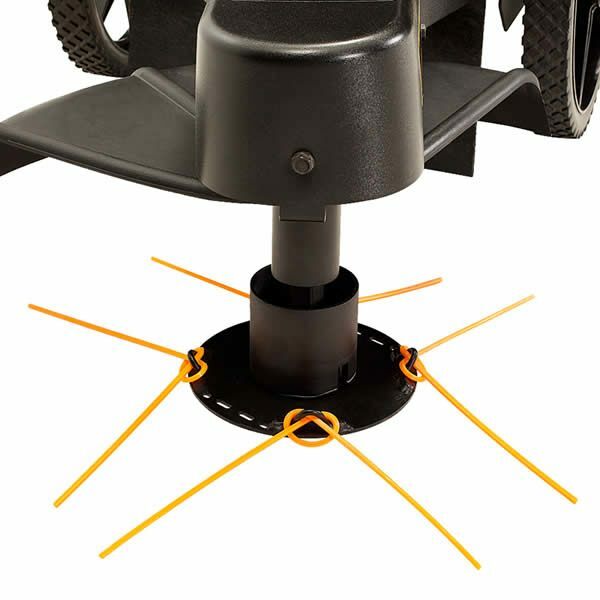 They range from 12" to 16" in diameter, which makes them easier to maneuver on uneven surfaces. Plus, the wheels are made of hardened plastic or a Never Flat material, so you won't get a flat tire if you're rolling it through an overgrown field that's littered with broken bottles and wind-blown trash (though you might need to clean up with a litter vacuum before you trim!). Although a few models have a cutting width of 17", most wheeled string trimmers have a cutting width of 22". Because they're designed to work beneath a frame, the string on wheeled trimmers reaches across a wide area so you can cut a lot at once. Push this trimmer into a patch of weeds, and you'll be done in no time. Most walk-behind trimmers use efficient, clean-running 4-cycle engines, which require oil changes and other simple maintenance to keep running smoothly. You won't find 2-cycle engines available as often on wheeled trimmers. They produce more fuel emissions and are louder to operate, but they are also lighter and easier to maintain. A common feature on wheeled trimmer engines is a recoil starter. Recoil start requires you to pull a starter rope to turn the engine over and get it going, similar to using a push lawn mower. Because these trimmers are used to take down thick, tough brush, you might find that the trimmer line breaks more often than it would if you were trimming around your yard with a hand-held trimmer. Your best bet is to have some replacement line on hand. Line comes in a variety of diameters and lengths, though wheeled trimmers tend to use line with a thicker gauge. Always use the diameter recommended by the manufacturer for the best results. Wheeled String Trimmer Buyer's Guide - Find out How To Pick The Perfect Walk-Behind String Trimmer. Our string trimmer how-to library can help you pick the perfect electric string trimmer, gas string trimmer, walk behind string trimmer or brush cutter.